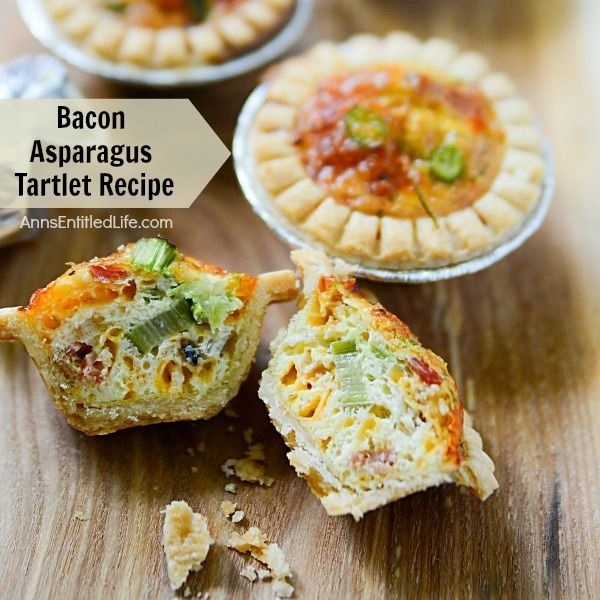 Ready in no time flat, these simple to prepare Bacon Asparagus Tartlet appetizers are just what your next party needs! Whether you serve as a snack or hors-d’oeuvre, this bacon asparagus tartlet recipe is a great addition to any gathering or celebration. From showers to wedding recipes to game day parties, these delicious little appetizers are sure to please your friends and family alike. Yum! Appetizers come in all shapes and sizes, from dips, to nibbles to individually served preportioned goodies on sticks, appetizers are great for parties, snacks, or to wet your appetite for the main course. 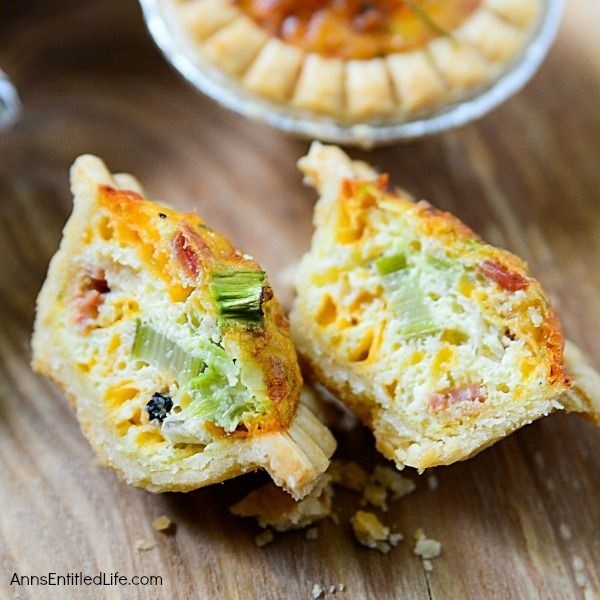 These Bacon Asparagus Tartlets are in the latter category. You can make them ahead of time and serve cold, you can bake them and hold in a warm oven, or you can serve hot (just allow to cool for a second or two so your guests do not burn their tongues on the hot cheese!). These also make a great little breakfast bite – wonderful for a brunch or on your holiday breakfast menu. Ready in about 30 minutes or so, this recipe is easily doubled, tripled, quadrupled … ok, I think you have the idea. You can multiply the recipe to serve more guests or to allow more than three (my serving suggestion) Bacon Asparagus Tartlet per guest. • The bacon needs to be precooked. • The asparagus in this recipe is not precooked. If you like a softer asparagus and want to sauté the asparagus for a bit to make it softer, allow it to cool down before using so it doesn’t cook the egg. You may be able to temper it, but cooling down would be easier. 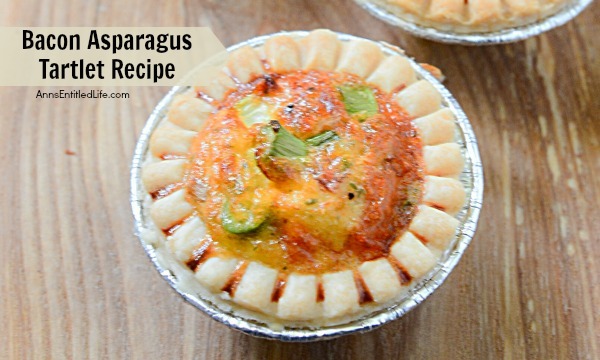 • If you choose to go with raw asparagus, it will be firmer in these tartlets. 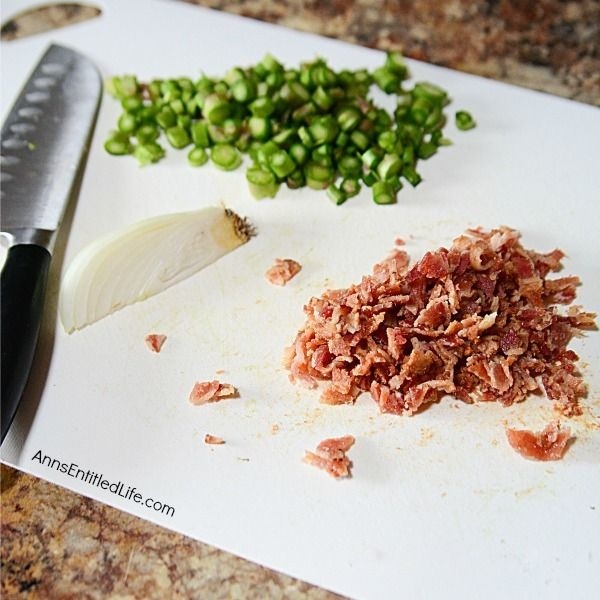 • Precook your bacon if you have not purchased precooked. 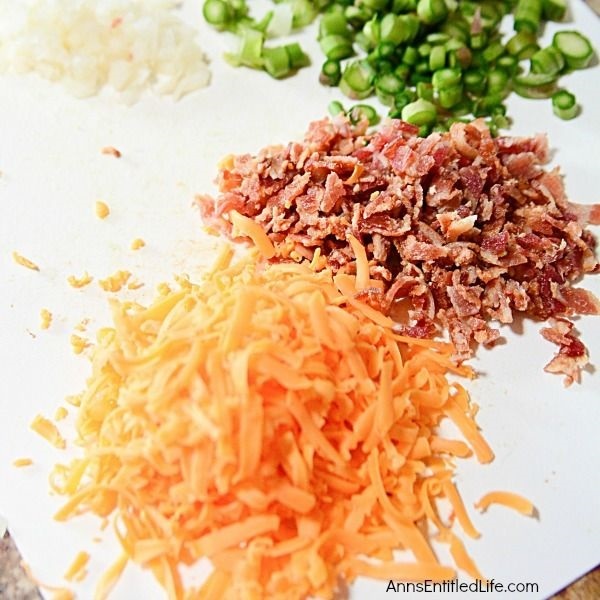 • Drain grease from bacon, cool slightly, dice bacon into small pieces. • Dice onion into small pieces. • Dice asparagus into very small pieces. 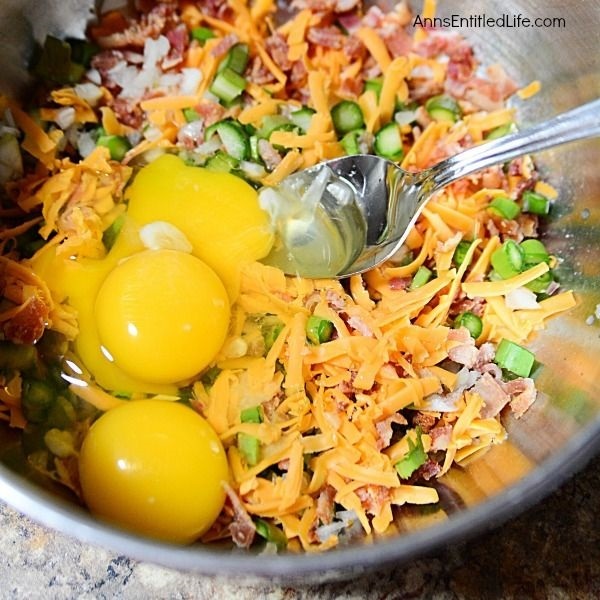 • Combine the diced bacon, onion, asparagus and cheddar in a bowl. Combine well. 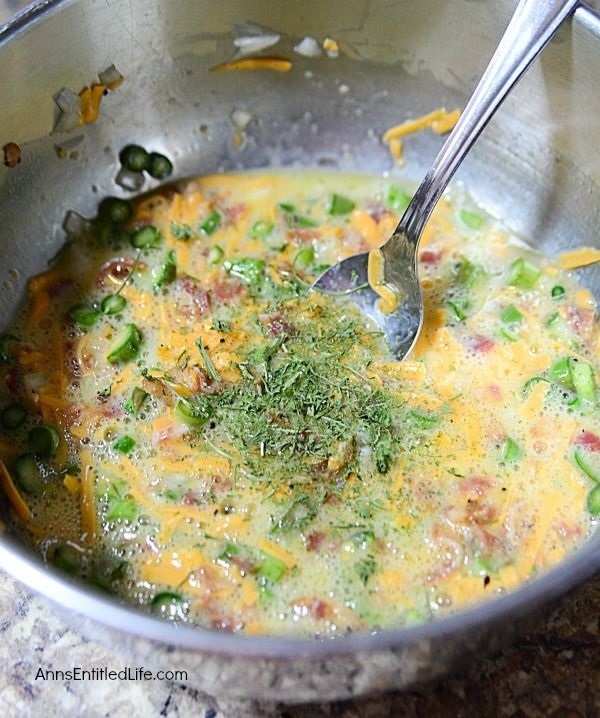 • Add the eggs, Italian herb seasoning, garlic, and salt and pepper to taste. Mix to combine. 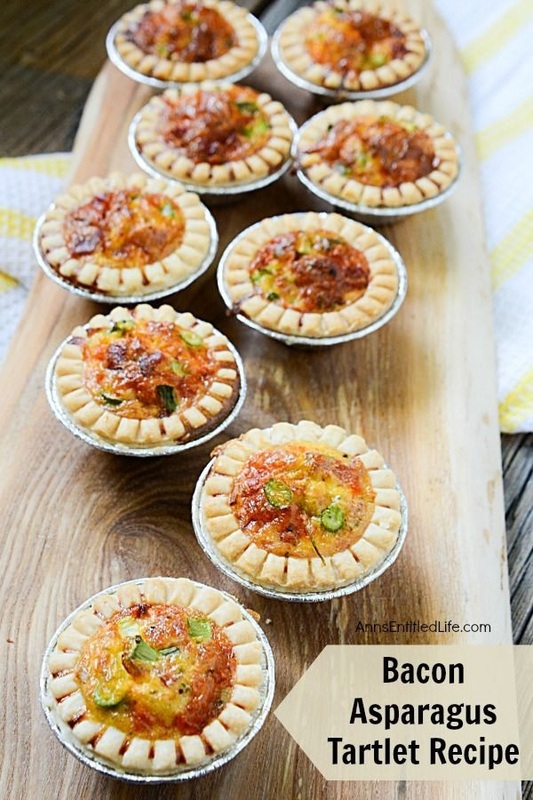 • Arrange the tartlet shells on a parchment-lined baking sheet. 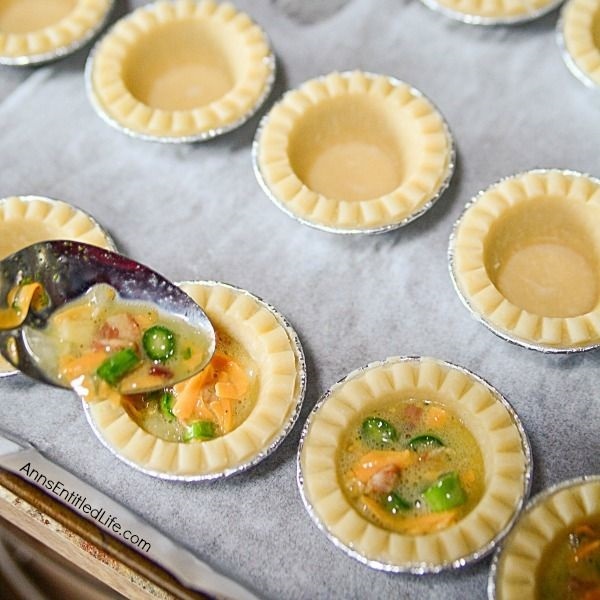 • Fill tartlets, dividing the filling evenly between all the tart shells. • Remove from the oven and let cool slightly before serving. Ready in no time flat, these simple to prepare Bacon Asparagus Tartlet appetizers are just what your next party needs! 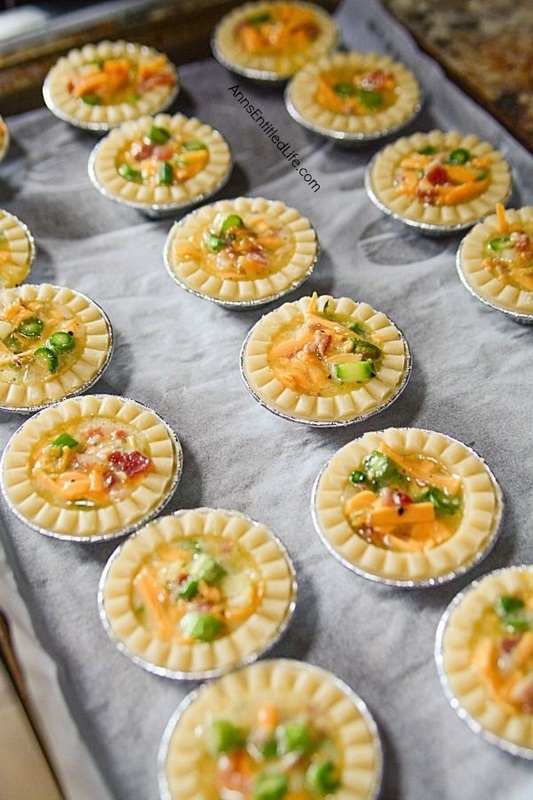 Whether you serve as a snack or hors d’oeuvre, this bacon asparagus tartlet recipe is a great addition to any gathering or celebration. From showers to wedding recipes to game day parties, these delicious little appetizers are sure to please your friends and family alike. Yum! 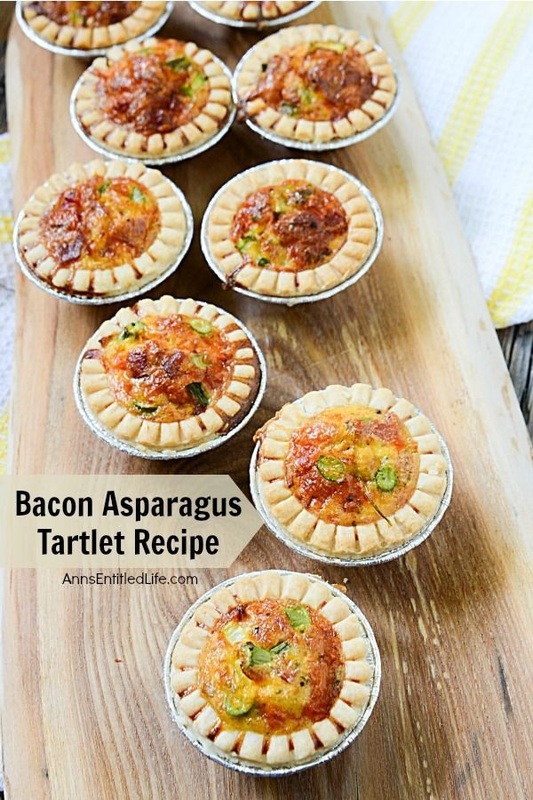 • To print the Bacon Asparagus Tartlet recipe click here. • Bruschetta made with Heirloom Tomatoes and Kale Recipe – This very versatile Bruschetta made with Heirloom Tomatoes and Kale is a perfect accompaniment with any meal, a before meal appetizer, or simply as a stand-alone snack. • Turkey Cream Cheese Pinwheels Recipe – Whether served as an appetizer or as a lunch entree, these tasty pinwheels really hit the spot. This appy looks and sounds so tasty. Where do you purchase the mini tart shells? Cindy, you can buy them at nearly any grocery or restaurant supply store. WalMart also carries them. You can find shelf-stable or frozen ones available. Your choice. These look so yummy and pretty easy to make! Yum! Thank you for sharing on Merry Monday! Hope to see ya next week!